When I first came to Japan I imagined that this would be one of the first orchids I would find in the wild, but after more than 8 years of looking, I have yet to see one wild specimen. It is a very common garden plant, often growing into large patches in time. It can also be seen grown in any manner of containers along street sides and is equally happy in rural or urban environments. I have seen one growing in a bonsai pot that has virtually no soil anymore – the plant’s bulbous rhizomes piled on top of each other like rocks, veritably overflowing the pot. Plastic containers housing huge clumps split over time from the plants over filling them and yet they just march on. The normal colored flower of Bletilla striata is known the world over. Various colored flowers have been selected while others have variegated foliage, the so-called “albostriata” varieties. Here’s a sampling of some on the world market today. The typical flower color tends to be consistent in most plants, a pink-purple, but darker varieties exist. Some flowers open widely, while others remain more cupped. There also exists a nearly white flower that retain a bit of pink in the lip or more commonly just the column area. It is no more difficult to grow than the typical variety. True albas also exist, but don’t look much different. 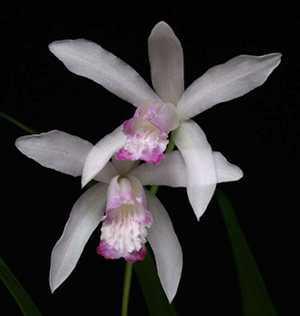 A slightly more rare pale flowered form exists, known as variety rosea. There are two commonly available blue forms of B. striata. The first is ‘Mursaki Shikibu’, a cultivar named after the famous ancient Japanese novelist. This plant has the “blue” cast found in other orchids such as “blue Cattleyas“, that is to say, the flower is more a lavender color. This form was first collected in Oita Prefecture on the island of Kyushu. Today it is being mass produced and recently has made it onto the world market. The flower segments are a bit “fatter” than a typical flower and the flowers tend to remain more cupped. It is said that plants come true from seed. The second blue form is ‘Soryu’. This plant was purported to have been collected in Wakayama Prefecture on the island of Honshu. It too now is being mass produced. There is some discussion that this cultivar might actually be a hybrid with the Taiwanese B. formosana rather than being a pure form of the species. It is difficult to know if folks are lying about its true origin, so this one remains a bit of a mystery. The plant tends to be a bit more dwarf growing than other varieties, and the flower’s shape is a bit off from a normal B. striata flower – again, a bit gracile looking. Here’s a video showing all the varieties covered in this article in my garden in southern Japan. 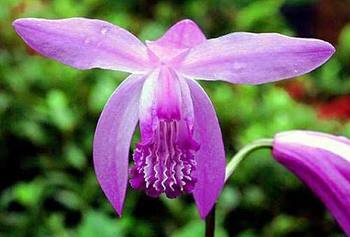 Bletilla striata cv. ‘Soryu’ like other forms of this species can form large clumps in time. This new cultivar shows marginal variegation in flower parts, not the leaves. A relatively new cultivar has marginal variegation not on its leaves, but the flower itself has a white margin on all flower segments. In all other respects the plant is identical to a typical B. striata. it is still scarce in cultivation even in Japan. The oddball of the bunch, B. striata c.v. ‘Trilips’. Perhaps the most unique form is the fascinating peloric flower form, ‘Trilips’. Besides boasting three lips, this one is notable for other reasons: the flower is quite small, perhaps half the size of a normal one, the flower color is a very deep, saturated purple/pink (more than in the photo), and the flowers produce no pollen. Once quite rare and so very expensive, they now are being mass produced and likely are finding their way onto the world market. Ten years ago this one would sell for $100 per plant, and now retails at 1/4 that price today. Bletilla striata c.v. ‘Rosea’. a lovely pale pink form. Often called the “hardy Chinese ground orchid” in the bulb trade, this species is by far the easiest terrestrial orchid to grow. If planted in any reasonable compost that doesn’t sour, it will grow and if given adequate sunshine it will also flower. The best conditions to grow this plant is in the ground in a nice rich loam that is constantly moist in full sun. It however is just as happy in a pot so long as it is well watered and gets good light. Too shady conditions will make plants spindly and flower much less. Fertilize as you would any garden plant or vegetable. While in growth these are heavy feeders. Hardy to USDA cold hardiness zone 5 with heavy mulch in winter, but happiest in warmer climates. Some people have even grown them in bog gardens, so the plant is quite adaptable. It is tricky to grow indoors however. If you live in a cold climate, I recommend growing them outside in summer and bringing them into a cold, frost free place for the winter. An unheated garage or the like is a good choice. These plants prefer a longer growing season, ideally from April through October, but a bit shorter won’t hurt them. One more interesting thing about this plant is that you can grow it from seed without aseptic growing conditions. All that is needed is compost that has aged outside – a potful of loam from a deceased plant is perfect to try and grow some Bletilla seed. All you need to do is sow the fine seed directly onto the soil and keep it moist. Once conditions are favorable, you may be rewarded with seedling plants. Given their ease of cultivation, some of the more rare forms will become more common in time. This is a hard plant to beat if you want to succeed with a terrestrial orchid. Four B. striata forms. From the top left going clockwise: ‘semi alba’, ‘normal’, ‘Murasaki Shikibu’, and ‘Soryu’. I just have had e good look around here and it looks great. I knew you where thinking about and working on this project for some years now but teh result is great. A good source of information on Japanese plants for us westerners! Hey Rogier, glad you like it so far. So, how are your Bletilla doing? The last time you sent me photos your ‘Murasaki Shikibu’ looked great. It must be huge by now. I am crazy about the Bletillas and I’d like to plant a lot of them in my garden. But I don’t know, where to recieve it no Brazil. Can you help me? Do you know where I can get it, or where I can order it in the internet? Thank’s a lot in advance for answering me. 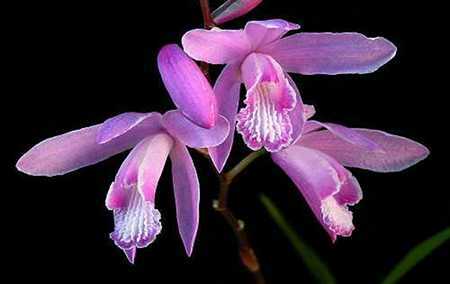 Sorry, I don’t know of anyone growing Bletilla in Brazil. Since this species grows from a thickened rhizome that is nearly bulbous, it can be stored dry and without roots while dormant. Plants don’t like that treatment, but they can endure it and within a couple seasons of planting even thrive. These are tough plants. I would recommend checking out large bulb companies in Europe that are willing to send overseas since many of these stock Bletilla bulbs. Since these are orchids, a CITES document will have to be sent along with them however. That can be pricey. Beyond that, I wonder how well they would do for you in your tropical climate. This species requires at a partial cool off in winter for a couple months. They grow fine in north Florida, but Brazil…I’m not sure. Central and South America are home to some fantastic terrestrials! The genus Bletia has members that rival or exceed Bletilla in beauty and they should do very well in your climate. Also check out some of the Cyrtopodium species from Brazil’s grasslands – WOW! I have about 100 or more bulbs that I dug up in my Western PA garden. I would like to plant them in my garden on Siesta Key in FL. Should I ship them now to FL to be planted or can I take them with me at Christmas and plant them in early Jan. Should I cut the roots back now? I’ve been dividing and giving away these Bletillas for years, love this plant. I would wait until Christmas since sending them now would only confuse them – like summer is starting all over again. The truth is that they will probably begin growing right away in Florida since it will too warm to keep them dormant. I grew this species in Gainesville, Florida and had problems keeping them dormant in February due to warm days – they would always begin growth and then we’d have a frost and they’d get damaged. Siesta Key is even more mild, so i can’t say when they’d grow there, but it probably will be very early. Do you have any growing outside there yet? As for cutting roots, I never cut them on this species since they do not naturally lose their roots on an annual basis. 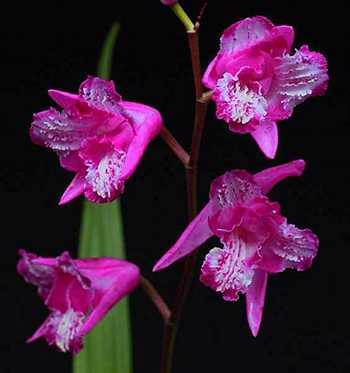 I have a botanical friend who claims thatthere is a native Bletilla in Central America. Have you heard of that? I have serious doubts. Hi Fred. 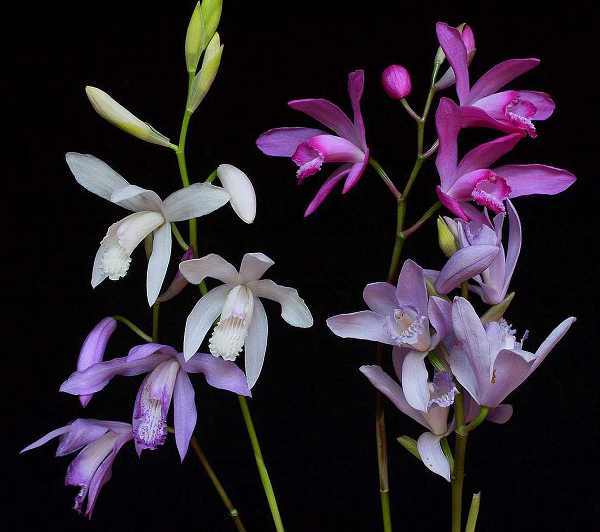 I think your friend is mixing up Bletilla with the Central and South American genus Bletia. Both genera are terrestrial, have erect racemes of (normally) purple to pink flowers, and grass-like leaves. One species of Bletia is even found naturally in Florida, B. purpurea. None in that genus are cold hardy, being found only in subtropical to tropical forests and grasslands. Hi – I have just recently bought a Bletilla Strata-alba, it was the only specimen available and it looks rather neglected but after viewing the video I am sure this beautiful ground orchid will recover. 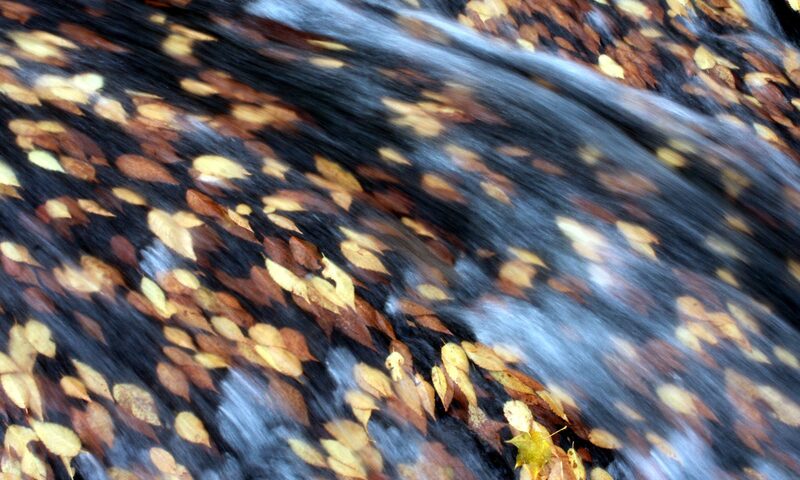 We are now in the start of our Autumn season so it will become dormant shortly. Thank you for the information given I am sure with care this plant will recover to its full show stopper beauty that it is. Oh, I am writing from South Africa! 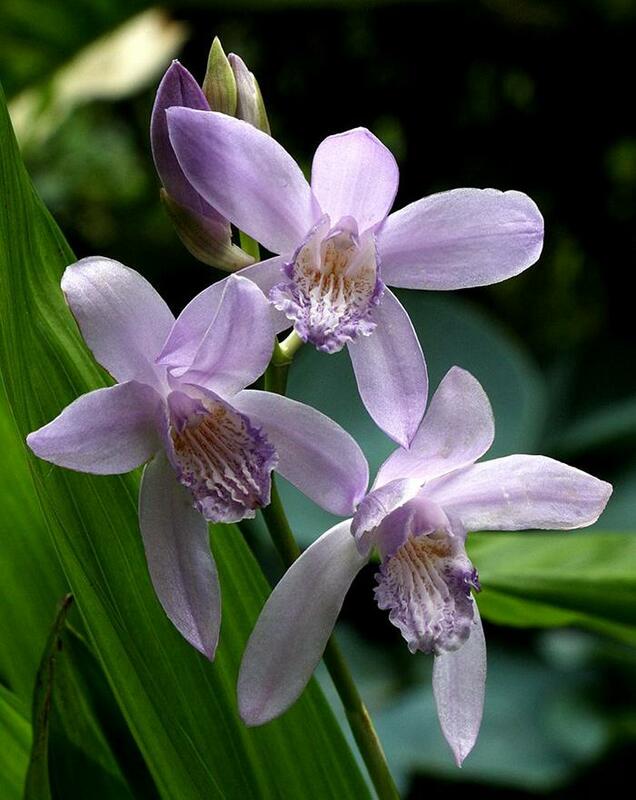 Where can I get Bletilla striata or other naturalizing ground orchids that will grow in Houston ,Texas? 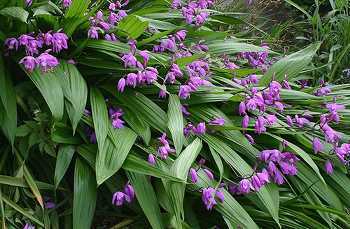 Sharon, the normal forms of Bletilla striata can be bought at any big box store that has a garden center. They are sold as root-less tubers in a bag. While these will not flower well the first season, they can be grown on to flowering within a year successfully. Look for them where bulbs are sold. They should cost around $4-6 per bag. Don’t be too put off by the prices as these plants are very vigorous growers and within a few years you’ll have too many yourself! I just bought the Bletilla Siriata yesterday and want to know if I must plant it in the sun or shade? I am from South- Africa. In a humid environment, I recommend full sun for this species. If the relative humidity falls below 50% most of the time I recommend a bit more shade, but not full shade or the plants will not flower. This species grows in moist to wet soils in full sun in the wild. Good luck with your plants Gerna! I found your article on Bletilla very interesting and I would like to grow some myself. I live in southeast England. Would you know anyone that might be able to supply me with some. Thank you in advance. 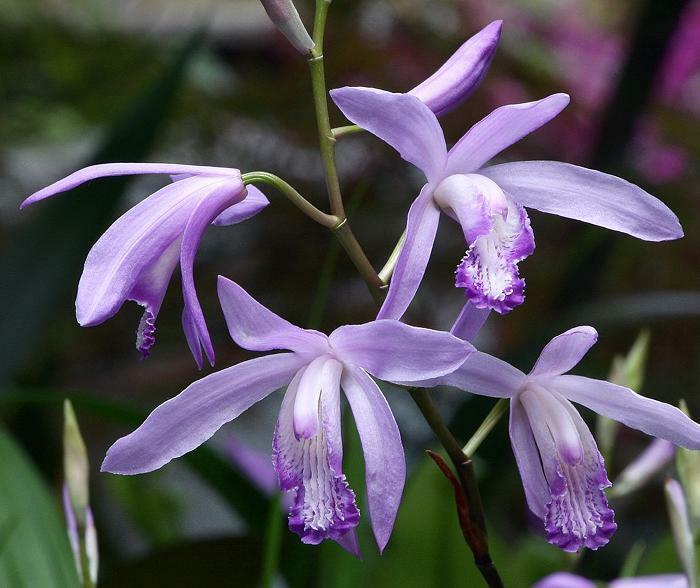 Hi – I hope you can help, I have recently been told by Catherine at Tesselaar’s Nursery that Bletilla straita is not an orchid. I have always believed it to be a terrestrial orchid, if this is not so and she is right, which family does it belong to? It most definitely is an orchid. Therefore it belongs to the Orchidaceae. 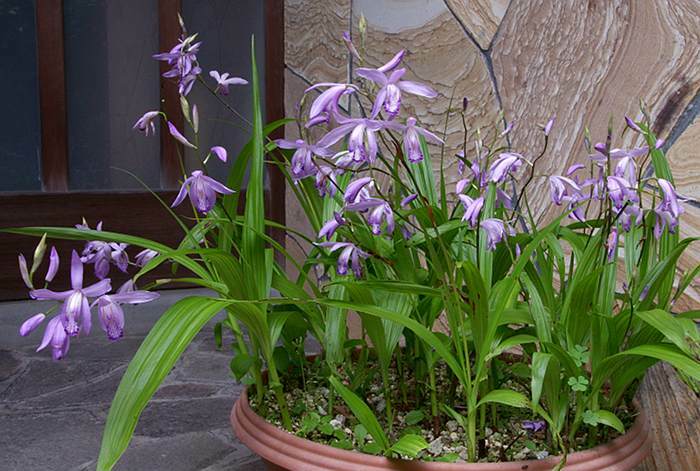 I just purchased 2 very young, small (less that 8″) Bletilla striatas from an online nursery. We have heavy clay soil here in WV. Is there any kind of soil amendment I need to do before I put my 2 babies in the ground? I noticed the plants growing very well locally. They should do OK if you lighten the soil a little by adding organic matter – composed leaves or the like should due nicely. You could also mount the bed they’re in for better drainage. Be sure to plant them in FULL sun for good flowering and keep them moist. Once established, these are pretty easy. I’d also mulch them quite a bit in winter to protect from severe cold events. They can take quite a bit of cold if protected this way. Good luck! I’m on Long Island in NY, USA. I’ve had ONE common bletilla in the ground outside for years, and it has never flowered. (I think I had it in spots that were too shady.) At first I thought it was planted too deep; then I raised it to about 3 inches deep; still nothing. Now it is mid-October, but still reasonably warm. I decided to dig it up and bring it indoors. Although it has always just been one stem with three leaves – I found a good-sized corm underneath. My question: can I get it to flower in a sunny window in the coming months, without giving it a cold or dormant period? It is in good loam, good drainage, plastic pot, with a plastic bag over it (with holes) to keep it somewhat humid. I gave it a small amount of seaweed fertilizer. Thank you! I don’t recommend you try to grow and flower it on the windowsill. These are notoriously bad house plants. Beyond that, at this point it requires a cold period to vernalize correctly. I grew this species in Florida and there it would be dormant for only around 3 months before growing again in February, but they still need a dormancy. I rather suggest you plant it outside in FULL sun in any good compost. A south facing wall or the like would be ideal. Based on what you’ve said, I don’t think it will flower next year either, but if grow well this coming year it should flower no problem. I had a friend in the UK who had a similar problem with this plant and after planting them in full sun they started to grow and flower like weeds. They can take quite a bit of fertilizer too when in growth, so don’t be shy, any good fertilizer will do – organic or otherwise. Thanks! I’d had it in the shade becuase thatt’s what had been recommended by others! I see they were wrong. I did think, from your descriptions of seeing in it all sorts of planters in Japan (and conditions) that it would be okay indoors. In any event, Just to be experimental – and given lack of bloom and spindly growth all these years – I’m still going to put it on a windowsill (in a yellow bag with holes) and see what happens. Some contrary info: I read from Allan Summers at Carroll Gardens that it perfers semi-shade, and that indoors it supposedly blooms in February. <–they have a preference for partial shade in compost-enhanced, well-drained soil that doesn’t dry out in summer. But I trust your advice and I’ll now be more inclind to get bletilla again, for when I buy some new pseudoblubs! I presume ‘corms’ available now in autumn in Zone 7 are awaiting a cold period outdoors, while those available in spring have already had a dormant period…. epipactis gigantea, a California native, is just as easy to grow. I’ve not grown E. gigantea, but have seen E. thunbergii grown very well grown here in Japan. Unfortunately virtually all had been wild collected. Epipactis is a strange genus, some are “easy” and others “impossible”, the latter acting much like the fungal dependent genus Cephalanthera. Bletilla striata I think is one of the most adaptable species in that it can take a wide range of conditions and still manage to do well. I know folks who grow it in relatively cool climates like the midlands of the UK, and yet it thrives in hot climates like Florida as well. It certainly can take a beating and keep on growing, and even flowering. Another easy terrestrial orchid I would recommend is Spathoglottis plicata (for frost free regions) – tough as nails and as a bonus it can flower for months at a time. There are bunches of other relatively easy species – some Pterostylis, Calanthe, Spiranthes, and even a few Cypripedium are not so difficult once you figure out what they need to flourish. hi Tom a nursery in Belgium is selling a variety of bletilla called cerulia .Have you heard of this variety or is this something new? John, I’ve seen both “blue flowered” B. striata cultivars (‘Murasaki Shikibu’ and ‘Soryu’) called forma coerulea. I suspect that is one or both of the plants in question.